Roofing maintenance hacks is a wonderful way to keep professionals at bay and your budget intact. Maintaining the health of your roof is important to maximize its life expectancy. If you are a fan of DIY projects, here are five things to do to ensure the health of your roof. There are times that looking at issues on your roof is not enough because you can’t see the tiny holes. What you should do is go to the attic. Use a bright light to shine on the ceiling so you will see any discoloration brought by small leaks on your roof. Cut Off Branches Looming Over the Roof. You don’t need professionals to do this for you. When you see branches hanging over the roof, cut them off. These limbs will leave debris and leaves into your roof that might clog your gutter. They can also be footholds for animals that can possibly damage your roof. When storms come, they can all snap off and damage your roof. 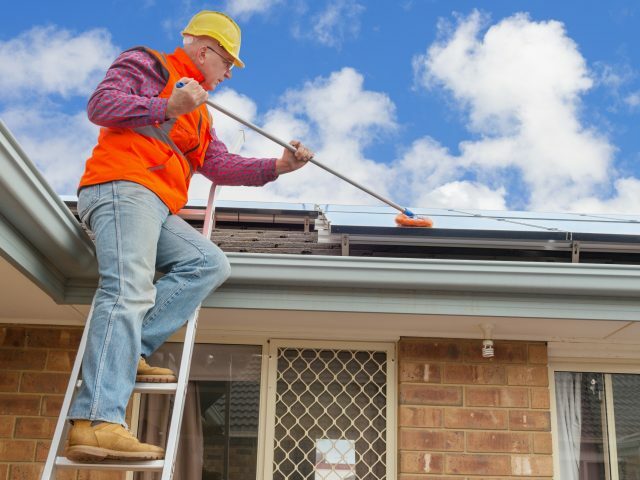 Gutter cleaning is a must especially when your house is in an area with extreme weather conditions. However, you can eliminate the worry of having clogged gutters with gutter protection. Gutter protection only allows water to pass through it, preventing roof and structural issues that may arise in gutters without protection. Installing a reliable gutter protection system will make gutter cleaning a thing of the past. Insert New Flashing Under the Old One. Installing new flashing and getting rid of the old one is best left in the capable hands of professionals. But if you are handy enough, you can just insert the new one under the old flashing for a quick solution. Flashing will prevent water from seeping between your roofs. Note, however, to insert the new one and do not pull out the old flashing. This roof maintenance hack is just a quick solution, and the permanent solution is best left with the pros. If missing shingles or losing bricks does scare you, make sure to patch these up right away. Some may think that letting go of small holes will not affect the integrity of the roof or the whole house. That’s a simple issue that may cause you more if you don’t treat it right away. Preventive maintenance is always better than spending a lot when the damage is already there. These roofing maintenance hacks will help you solve the problem and ensure a long lifespan for your roofing material.